SCIENCE, LIKE ART, is a human expression. Roald Hoffmann has given a great deal of thought to how to convey this truth, which lies at the heart of the essays collected in his new book. He understands, perhaps better than most, the importance of humanity to science: how science, the beautiful search for the sublime—the “joy of self-assertion ... in the face of an uncontrollable world”—is no longer science when it is stripped of its humanity. “I was born in a happy young Jewish family in unlucky times, 1937,” Hoffmann tells of his childhood in Ukraine. “In that war, most of us perished ... among those who were killed were my father, three of four grandparents, three aunts, and so on.” Hoffmann, his mother, and his sister survived by hiding in a schoolhouse storeroom. He returned there many years later to find that the storeroom had been rebuilt as a classroom: “It’s a chemistry classroom,” he says simply. “Such is fate.” He tells the story in a lecture at the American Chemical Society, titled “Trying to Understand, Making Bonds,” and reproduced as the first essay in this volume. Fate brought Hoffmann books on Marie Curie and George Washington Carver during those difficult years, and then to America, and finally to the study of chemistry, at Columbia and later Harvard, where with R.B. Woodward, he pioneered research on the process of chemical reactions—the foundation on which much progress in organic chemistry rests today. But it could not have been merely the hand of fate that eventually led him to win the Nobel Prize in Chemistry, shared with Kenichi Fukui, in 1981. But how does one speak chemical knowledge? Chemistry as a study of molecular transformation—the physical actions of atoms colliding, electrons moving in space—is one for which representation in words is inadequate. So chemists draw pictures instead, symbolic codes that inform the basis of chemical thought. The chemical structure, with all its meanings attached, “enters the conscience of a chemist directly ... and the chemist manipulates that little picture mentally in a multiplicity of ways.” Manipulations of these thought-pictures make up underlying concepts in organic chemistry, to which we then can assign terms like “steric hinderance” and “stereochemistry.” How the chemical structure relates to language, to art, and to modes of thinking are ever-present themes in Hoffmann’s work. Through his exploration of these subjects, we are exposed to a dizzying amount of knowledge about history and philosophy and chemistry. We are taken on a tour that can link Derrida’s concern with writing to new allotropes of carbon (geometric arrangements of carbon atoms bonded together). The examples and references themselves raise provocative questions. Take, for example, printing history and its relationship to the structure of the organic compound norbornane, which Hoffmann considers in “Representations in Chemistry”: chemistry journals up through the 1950s did not print lines at an angle (for reasons of cost), rendering the drawings of chemical structures two-dimensional. The structure of norbornane, a seven carbon molecule with six of its carbons bonded in a ring, was depicted as two connected squares, with a carbon atom at each corner, and the lines of the squares representing their bonds. But the structure of bonding around carbon is tetrahedral—in other words, carbons bonded together as they are in norbornane do not lie on the same plane. 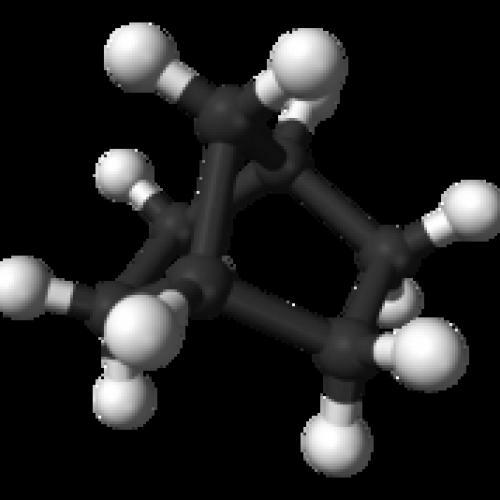 The physical structure of norbornane has carbon atoms in three dimensions of space; these positions affect nonbornane’s ability to interact with other atoms, and thus whether and how a chemical transformation can proceed. So understanding the shape of a compound is vitally important for understanding a reaction. But this information gets lost when pictured as a flat figure. And if this presents a challenge to manipulating the thought-picture of norbornane, if the flat image conjured up by the word “norbornane” changes how one imagines a chemical reaction occurring, what might it suggest about the cognitive process of linguistic relativity, or Saussure’s ideas about the relationship of word-things? These elements are always at work in science. A story about the discovery of sucralose, perhaps apocryphal, tells of the graduate student who mistakenly believed that he had been asked to taste rather than to test what he had made. The mistake proved a happy one (not usually the case when one tastes things one makes in a chemistry lab): today sucralose is found ubiquitously as the compound used in many artificial sweeteners. But the discovery makes for a much less interesting retelling when published with the human element omitted. To construct a narrative—why A goes to B, or how to get from A to B—is a natural way to make sense of things. Telling the whole story can strengthen connections, or reveal gaps in thinking, and be used to improve what logic is used when we do science. The beauty of narrative is that it simplifies, but therein lies danger too, because what if the world is not simple? “Ockham’s Razor and Chemistry” and “How Should Chemists Think?” are two of Hoffmann’s finest essays on the nature of thought in science. Though we must have the knowledge and acumen to rationalize the world and order our ideas, we must also remember that the pathways to a conclusion are infinite, the possibilities endless. “Time and again the process of discovery in science reveals that what was thought simple is really wondrously complicated. ... But ...one should beware of the inherent weaknesses of the beautiful human mind. The most prominent shortcoming is not weak logic, but prejudice, preferring simple solutions.” We must work to think about how to approach that weakness. For a collection of works that addresses the concerns of audience, logic, and narrative structure within the framework of science, the structure of Hoffmann’s book is strangely obtuse. The order the editors chose to present these essays gives no sense of coherent narrative or the themes the essays articulate so well. The book is divided into five parts: Chemical Reasoning and Explanation, Writing and Communication in Chemistry, Art and Science, Chemical Education, and Ethics in Science. They are rather shallow categories to divide along, and do not illuminate or build upon Hoffmann’s insights in a compelling way. True, it is difficult to edit a volume with its contents meant for different audiences—pieces from Angewandte Chemie, a specialized journal, are reprinted next to ones from Social Research, and the language in things written for American Scientist differs vastly from the language in Journal of Aesthetics and Art Criticism. But this is precisely one of the problems Hoffmann wants to address. A reader unfamiliar with chemistry would certainly stop after the first few essays, put off by the unfamiliar figures and references, with little reason to care about “Why Buy That Theory?” or “Near Circular Reasoning.” For those familiar with chemistry, this is perhaps not a problem, and it is easier to approach the many enlightening points in Hoffmann’s writing. But chemists are always looking for the next step of the chain, building upon a foundation to reach something new. Here, excellent foundations are presented, but we are never allowed to make the connections and construct greater ideas from one essay to another, because the logic has been scrambled out of continuity. How the story of science is told to us matters; because it informs how we think about science, how we practice it, how we advance it, and how human it is. Roald Hoffmann has done much to reveal and to celebrate the beauty and the humanity of chemistry. He has done so as a scientist himself, but also as an essayist, a poet, a playwright, and as a teacher. He continues to do it today, still hosting a monthly gathering called “Entertaining Science” at a coffeehouse in Manhattan. The thoughts expressed in this book, like the subjects they explore, are challenging, and sometimes not helped by their presentation, but they deserve the attention of inquisitive minds.